The caterpillar grows to a length of about 1 cm. When one caterpillar encounters another, they each produce a small amount of brown liquid from the mouth, and this causes the Caterpillars to walk apart. This appears to be a mechanism that prevents overcrowding of the caterpillars. Unfortunately for the caterpillars, this mandibular secretion also attracts parasitoid wasps such as Venturia canescens ( ICHNEUMONIDAE ). The adult moths are fawn coloured, with a fringe on the back of each hind wing. The wingspan is about 2 cms. The males and females come together using pheromones the chemical nature of which have been identified. 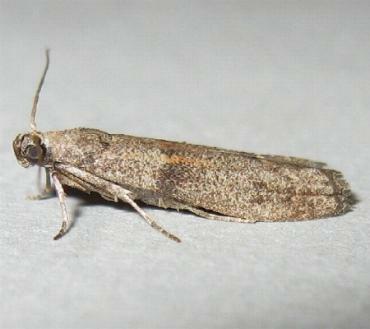 The females emit these chamicals and the males sense them and fly to the female. The adults also use ultrasonic sounds (~80 Khz) in their courtship behaviour. Melbourne University Press, 1990, p. 350. Ohio Agricultural Reseach and Development Center. Part 27 (1863), p. 73, No. 27.